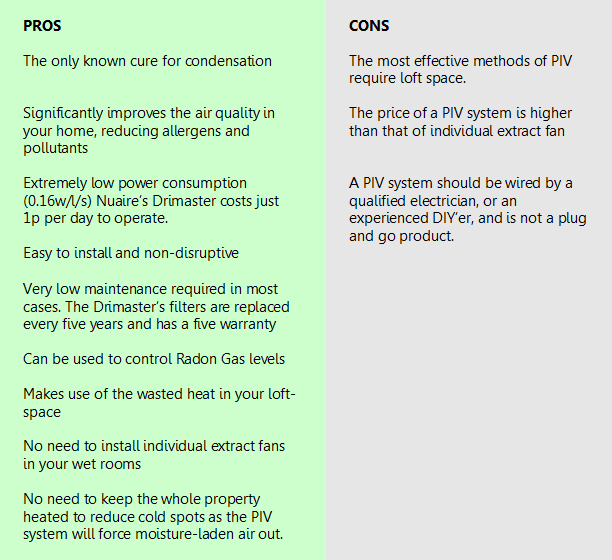 The PIV process involves drawing fresh air from outside into a fan located in the loft area. The air is filtered and tempered using the heat that naturally accumulates at the top of the house. It is then gently pushed into the home through a single, centrally located air diffuser, thus causing positive pressurisation. By continuously supplying fresh, filtered air through the home, the moisture-laden, stale air is forced out through the natural leakage points at a typical rate of 20 air changes per day. This strategy is extremely cost effective to run using an average of 0.16 watts/litre/second, and costing approximately 1 penny per day to operate. As a whole-home ventilation strategy, onesystem provides effective ventilation for the whole property, however if your home has a remote wet room, for example, an en-suite bathroom off a bedroom and not directly off the main landing, you will need to install an extract fan to meet building regulations. PIV is quick to install. Installation takes a few hours, and is non-disruptive as the unit is fitted in the loft, out of site, and there are no holes to knock through external walls or windows. Unsure of what type of damp you have in your property? There are 3 types of damp, click on the links below to find out what type of damp you have. Alternatively, contact us to book in a full damp survey and report. The cost of which will be offset should we carry out the work for you.